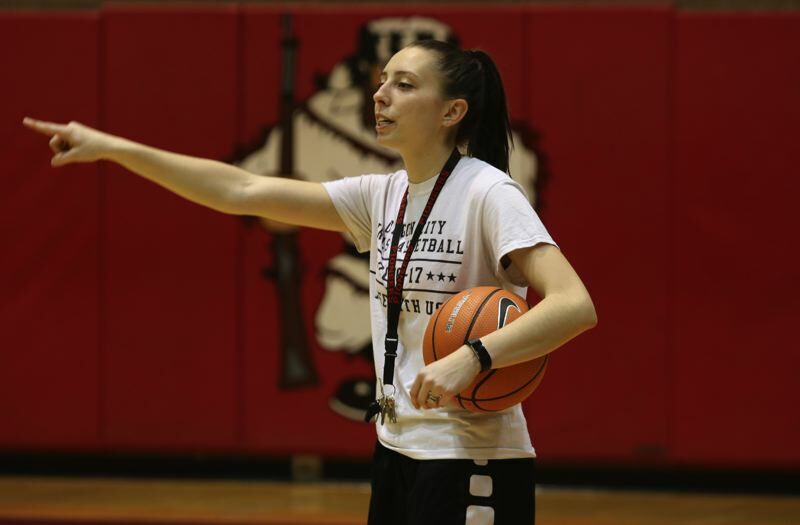 As Tiffani Traver prepared for Thursday night's open gym at Oregon City High School, she was still trying to wrap her head around her new job title -- head coach of the Pioneers' girls' basketball team. For her, it's a dream come true. Traver, 26, was promoted from her position as an assistant to replace Kurt Guelsdorf, taking over a program that she once played for. 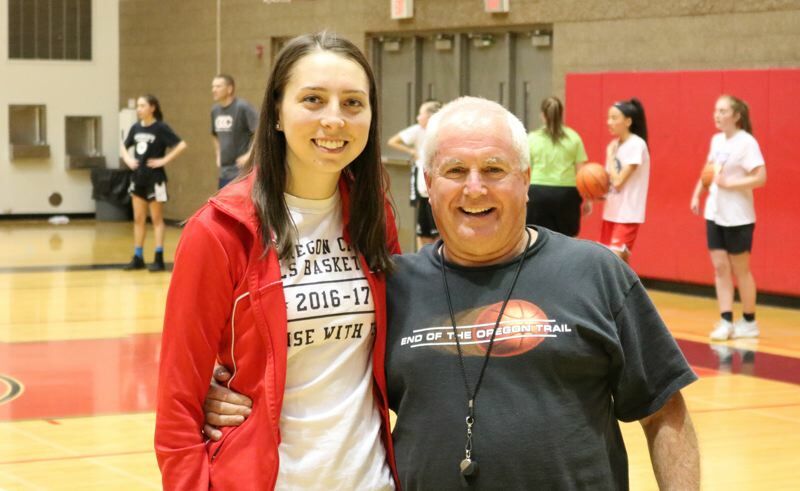 The Pioneers also announced that legendary Oregon City coach Brad Smith, the state's all-time winningest girls' basketball coach, has accepted a position as a volunteer assistant, rejoining the program that he helped build into a perennial state power before stepping down in 2006. Traver, the former Tiffani Brewer, is a 2010 graduate of Oregon City who played on the Pioneers' 2009 state championship team under Guelsdorf. She went on to play college ball at Whitman College in Walla Walla, Washington, where she earned a degree in mathematics. She then went to the University of Nevada-Las Vegas where she earned her masters in education while also working as an assistant coach at Desert Pines High School. In 2016, Traver returned to Oregon City High School as a math teacher and joined Guelsdorf's staff as a varsity assistant. She becomes only the fifth head coach in the history of the Pioneers' program, following Gary Storey, Smith, Carl Tinsley, and Guelsdorf, respectively. "It's hard to even fathom, yet it's always been a dream of mine," Traver said. "I'd always said growing up that I wanted to teach and I wanted to coach, and now I'm here doing both full-time, and … I'm the head coach now, and that hasn't fully set in. "It's a big deal because I love this program so much. This program really shaped who I am as a player, having played in it from the fifth grade on up. Seeing the positive effects that it had on my life, to be able to give our youth and our players that same experience that I had and continue the tradition means a lot." Traver has retained Jess Anderson and Chelsi Brewer as her two lead assistants, and she is still in the process of adding other staff and defining Smith's role in the program. "Brad has offered to do whatever we need him to do," Traver said. "Right now, he's helping us run our open gyms and we're learning a lot from him. We plan the open gyms together and he gives us advice about summer scheduling and practice times and other things. "As far as next season goes, Brad's role kind of depends on where he feels that we're at and what we're ready for, and then what supports we feel that we need." Smith, 65, went 629-92 and won 26 league titles and 10 state championships in 27 seasons at Oregon City before turning the program over the Guelsdorf in 2006. He has kept his hand in the game working with Tinsley to put on the End of the Trail summer tournament series, along with the work he has done with the Nike Elite Youth Basketball League and as a consultant with the University of Oregon women's basketball program. "It's a labor of love," Smith said during a break in Thursday's open gym session. "Before they decided on a new coach and when it was time for the open gyms to start, Tiffani and Jess were running things and I was asked to come up and lend some stability just with my name. "I see my role as trying to remove myself as quickly as possible. And I mean that, honestly. I think it's more of a temporary thing and I'm doing this for all those people who worry about where the program might be headed." Smith doesn't see himself taking a seat on the Pioneers' bench next winter. "I think that defeats the purpose of the things you're trying to accomplish," Smith said. "Tiffani needs to feel that game-time pressure and everything else. "Now, maybe I could sit there and be the old sage on the bench, but I think the other thing that happens is it's like having your dad in the stands. She calls a timeout and people wonder, 'What's dad going to do?' I'm not doing anything like that, and that's why the very best thing that you can do is give anybody the opportunity to fail and succeed on their own. "That's why, to me, anything else is just kind of a band-aid on the situation. If it's going to grow the way we believe it's going to grow, then these coaches are going to do it, and they're going to do it the right way." Traver's promotion comes four weeks after Guelsdorf was ousted as coach, ending a 15-year run that saw the Pioneers win 13 league titles and three state championships. "The program means so much to me that I didn't want to see it go someplace that we don't want it to go," Traver said. "After long talks with my husband, my parents, and Brad about the position, it was like, 'We're going to do this,' and then see if it happens. I'm very thankful, and thankful to the Lord that it happened, because it's His plan, ultimately. "There are a lot of things that have stayed the same since Brad was here and we want to keep those traditions alive. It's going to be a challenge, for sure, and I'm excited for what's next."